I have never seen anything like this before. 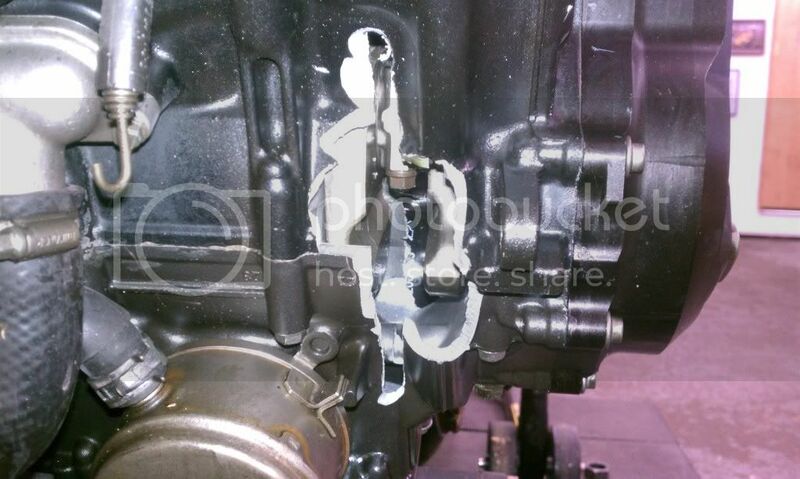 A cylinder piece broke and fell into the high revving engine. The crankshaft and rod picked the metal chunk up and got stuck immediately after a quarter turn. The right crankcase in torn open in 3 spots. Farewell my former CR 250 engine. What year motor is that 90-91? wow good eye mate! It´s a 90 motor. I have been looking for a replacement as rebuilding the current one is expensive. I have calculated 700€ minimum with ebay parts. Europe is really bad for MX spares. The American market is full of CR parts though. If you know anyone who has a spare complete motor, let me know. Well ain't that a bite in the pants? Yeah ebay US is full of CR parts, vintage or not. Good place. I saw the motor you posted the day before yesterday, but didn´t fancy the crack in the oil drain screw area. Thanks for the link though! What I was wondering, would another year motor bolt right up to the mounting holes and swingarm? I know that I would need to sort out the hosing and get a pipe, but that would be alright as long as the price was right. Not as bad as what happened to my R6 motor. The lower section does look like my 92-01. If you want to take some measurements and email to me, I can check them against mine. Nothing lasts forever. Good luck with your project.